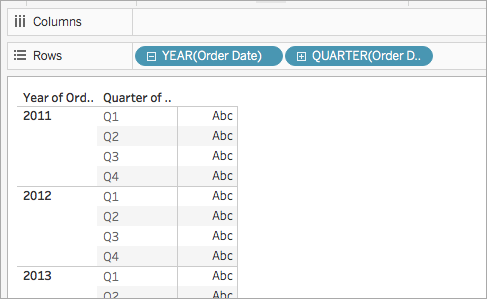 This article introduces date functions and their uses in Tableau. It also demonstrates how to create a date calculation using an example. Follow along with the steps below to learn how to create a date calculation. In Tableau Desktop, connect to the Sample-Superstore saved data source, which comes with Tableau. On the Rows shelf, click the plus icon (+) on the YEAR(Order Date) field. QUARTER(Order Date) is added to the Rows shelf and the view updates. 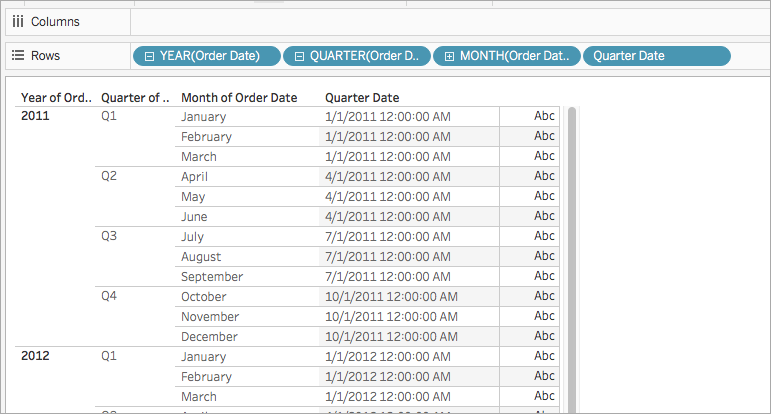 On the Rows shelf, click the plus icon (+) on the QUARTER(Order Date) field to drill down to MONTH(Order Date). Name the calculated field, Quarter Date. The new date calculated field appears under Dimensions in the Data pane. Just like your other fields, you can use it in one or more visualizations. 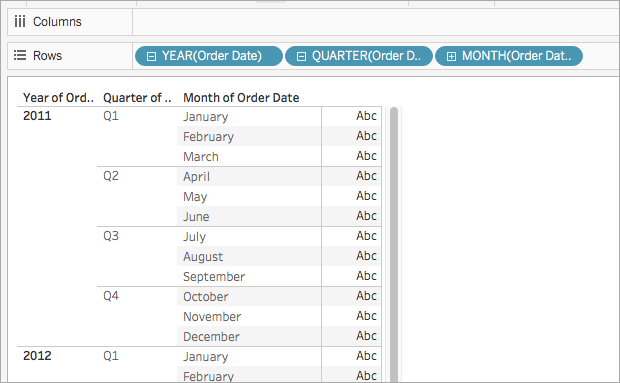 From the Data pane, under Dimensions, drag Quarter Date to the Rows shelf and place it to the right of MONTH(Order Date). The visualization updates with year values. This is because Tableau rolls date data up to the highest level of detail. On the Rows shelf, right-click YEAR(Quarter Date) and select Exact Date. On the Rows shelf, right-click YEAR(Quarter Date) again and select Discrete. The visualization updates with the exact quarter date for each row in the table. Date functions allow you to manipulate dates in your data source. For example, you might have a date field with year, month, and day for each value (2004-04-15). From these existing values, you can create new date values with a date function, such as the DATETRUNC function. For example, you can find the date of the beginning of the quarter for any existing date value. So, if the original date is '3/27/2011', using the above calculation would return '1/1/2011' to indicate that Q1 started on January 1. If the original date is '5/3/2011', then the calculation would return '4/1/2011' to indicate that Q2 started on April 1, four months into the year. See the Create a date calculation section below for an example. The ISO 8601 format is an international standard for calculating dates and times that differs from the Gregorian calendar due to how the starting week of a year (Week 1) is calculated. In the Gregorian Calendar, the user can define on which day a week begins. In the ISO 8601 Standard, the week always begins on a Monday. In a Gregorian Calendar when a new year starts, Week 1 of the year is counted as starting on the 1st of January, regardless of where in the weekday the 1st of January occurs. If January 1st falls on a Saturday, then Week 1 will have one day in it and Week 2 will begin on the following Sunday. In the ISO 8601 format, Week 1 of a new year begins on a Monday and has four or more days in January. For example, if January 1st falls on a Saturday, then Week 1 will not begin until the following Monday, January 3rd. Calculating dates this way makes sure that there are a consistent number of days in Week 1 of a new year. For more information on formatting date functions, see the Literal Expressions section of the At a glance: calculation syntax table. Note: Date functions do not take account of the configured fiscal year start. See Fiscal Dates for more information.